New York city is the most populous city in the United States and the center of the New York metropolitan area,and one of the most populous urban agglomerations in the world. Here are some of the most famous points of interest in New York City. The Empire State Building is a 103-story skyscraper located in Midtown Manhattan, New York City. It has a roof height of 1,250 feet (380 m), and with its antenna spire included, it stands a total of 1,454 feet (443 m) high. Its name is derived from the nickname for New York, the Empire State. The Statue of Liberty is a colossal neoclassical sculpture on Liberty Island in the middle of New York Harbor, in Manhattan, New York City. 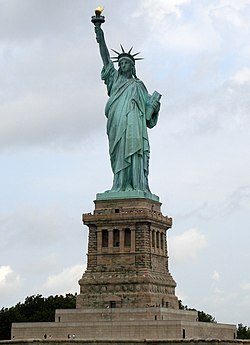 The statue, designed by Frédéric Auguste Bartholdi and dedicated on October 28, 1886, was a gift to the United States from the people of France. Central Park is an urban park in the New York City borough of Manhattan. It was initially opened in 1857, on 778 acres of city-owned land. The Comcast Building is an Art Deco skyscraper that forms the centerpiece of Rockefeller Center in Midtown Manhattan, New York City, United States. Known as the RCA Building until 1988 and the GE Building from 1988 to 2014, is most famous for housing the NBC television network headquarters. The headquarters of the United Nations is a complex in New York City. 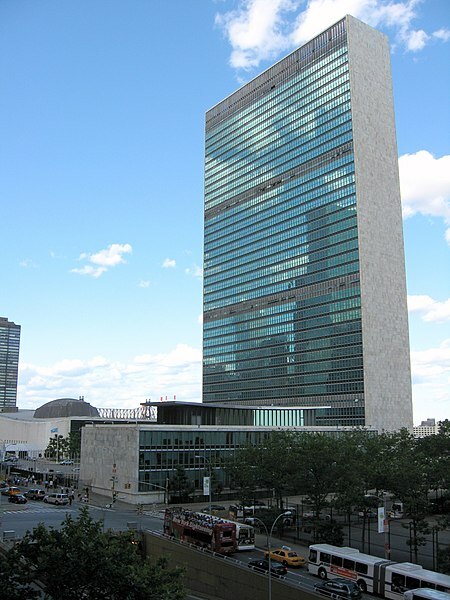 The complex has served as the official headquarters of the United Nations since its completion in 1952. It is located in the Turtle Bay neighborhood of Manhattan, on spacious grounds overlooking the East River.